Hospitals and nursing homes, by failing to properly maintain their water systems, may be putting older patients at high risk of an unusual form of pneumonia, with federal officials tracking 1 in 5 suspected or confirmed cases of life-threatening Legionnaire’s Disease to health care facilities. 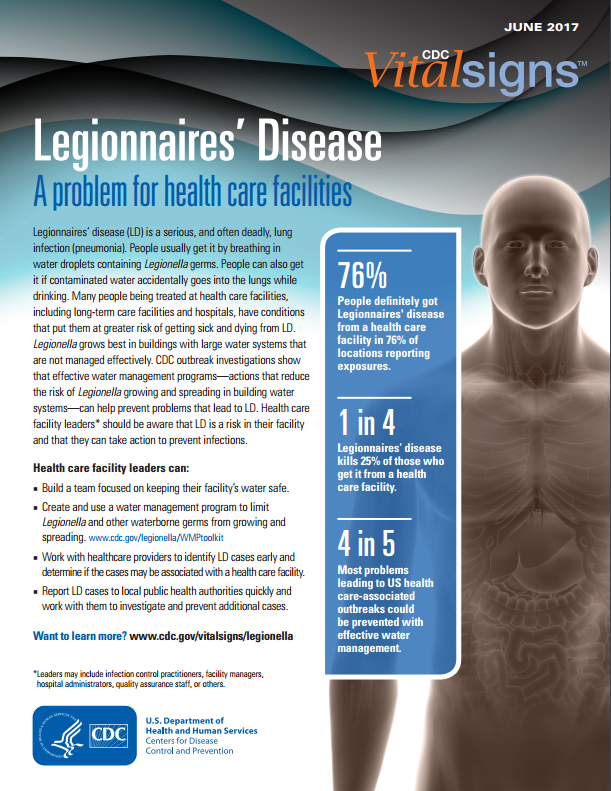 CDC researchers analyzed 2,809 of 6,079 Legionnaire’s cases nationwide in 2015 alone. They found 553 cases in 21 different and targeted jurisdictions, including Virginia, definitely or possibly occurring in a nursing home or hospital. The infections caused 66 deaths. Legionnaire’s poses a higher risk to the elderly and patients with compromised immune systems. It kills roughly a quarter of those who contract it in a health care facility, though this and other statistics on it may be under-stated because it may not be diagnosed separately from other serious pneumonia cases. Nursing homes more often than hospitals were culprits, likely because patients stay in them longer and are more likely to be exposed to the bacteria, particularly when aerosolized and carried in inhalable, tiny, mist droplets in showers or air cooling systems. 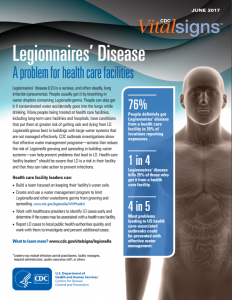 Failure to keep water sufficiently hot or chemically disinfected in tanks and other storage, as well in pipes, can allow Legionnaire’s to grow and spread. The disease burst into public consciousness when epidemiologists went into high gear and first detected and named it for those sickened by it at a 1976 American Legion convention in Philadelphia: More than 200 Legionnaires staying in hotels in the city came down high fevers, hacking coughs, and a pneumonia-like condition that proved fatal to more than 30. Public health officials traced the outbreak to Legionella in poorly treated water in hotel cooling towers. Thousands of cases now are diagnosed and reported annually, and health officials say that careful monitoring and reporting of them plays a key role in preventing deadly outbreaks. Indeed, Arizona public health authorities are praising the attentiveness of an unidentified infectious disease specialist in their state in alerting expectant moms and midwives to Legionnaire’s perils in the alternative and popular practice of water-birthing. The expert noticed quickly two separate cases in which newborns had contracted Legionnaire’s after their moms, with midwives, had delivered in inadequately sterilized birthing pools or Jacuzzis. Arizona has warned licensed midwives about Legionnaire’s risks and created materials to help them safeguard babies. Although Legionnaire’s may seem exotic, health care acquired infections, sadly, are all too common, afflicting almost a three-quarters of a million already sick Americans annually, especially in hospitals. They are part of a plague of preventable, medical mistakes that claim an estimated 685 lives each day, contributing to what may be the third leading cause of death in this country and trailing only cancer and heart disease. In my practice, I see the harms that patients suffer while seeking medical services and while in nursing home care. I agree with Dr. Suchat of the CDC that it’s unacceptable for people who already are seriously ill or incapacitated to be infected with Legionnaire’s when trying to get medical services or care. At a time when hospitals and nursing homes are booming and their cash registers are ringing, it’s unconscionable that fundamental maintenance issues can sicken patients. We could use fewer shiny health care buildings and more medical facility service basics—and since when isn’t clean hot water among those?